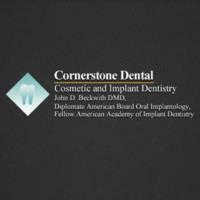 Cornerstone Dental is led by the very talented Dr. John D. Beckwith and has practice locations in Hillsborough and Green Brook, New Jersey. Our highly trained staff is committed to providing each patient with personalized care in a safe and a comfortable atmosphere. We are dedicated to improving your smile through a wide variety of treatments and procedures including teeth whitening, porcelain veneers, tooth colored fillings, dental implants, TMJ solutions, Invisalign, periodontal care, and much more. If you are interested in learning more about how Dr. Beckwith can improve your overall dental health, please visit our website or contact our office today.